Uzenzele Intelligence (U.Intel) was established to provide consulting and training services to address the need for specialist interventions, an outsourced function for access to finance in the supplier development ecosystem and the education of the role-players in the ecosystem (SMEs, financial institutions, business development practioners and procurement), to address the lack of access to capital for SMEs within public and private supply chains. 93% of SMEs don’t know where or how to access finance, this puts procurement and SCM (supply chain management) at risk with many local SME contracts being unfulfilled. Furthermore, many SMEs lack the equity contributions and security needed for capital to be raised. Education of the role-players in the ecosystem (SMEs, financial institutions, business development practitioners and procurement) is critical to address the lack of access to capital for SMEs within public and private supply chains. With the emphasis on supplier development in public and private supply chains, a better understanding of the SMEs capital raising landscape and requirements is necessary to ensure a structured solution. 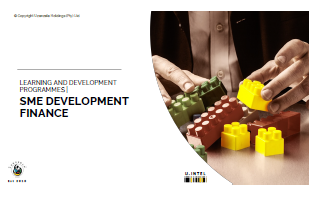 U.Intel’s training will unpack incentives (grants), development finance, venture capital and private equity mandate examples to assist procurement in their supplier development and localisation requirements ensuring capitalisation and quality supply. Many SMEs lack the equity contributions and security needed for transactions to conclude and convert at credit committee and these SMEs look to financial institutions for answers on how to bridge the gap. Most dealmakers have a limited understanding of the instruments and mechanisms available to provide a blended financial structure for SME transactions. U.Intel’s training will unpack incentives (grants), development finance, venture capital and private equity examples to assist dealmakers in helping their clients increase bankability as well as farm prospective clients for larger ticket sizes. Whilst our bankable training programmes will provide SMEs with the fundamentals on bankability requirements and where to access finance for their type and stage of business, depending on the maturity of the business, its team dynamics and their capital raising ambitions, coaching over a short or long period of time assists SMEs to be accountable to an action plan of becoming investment ready and bankable. This is often a longer process (3 to 24 months). Without regular accountability and guidance, SMEs who could be financed and scaled are often unable to secure finance and fail. Bankability must be built into a business. Our coaches and business mentors focus SMEs in this journey. To accurately apply for the right funding at the right place for the right reasons.